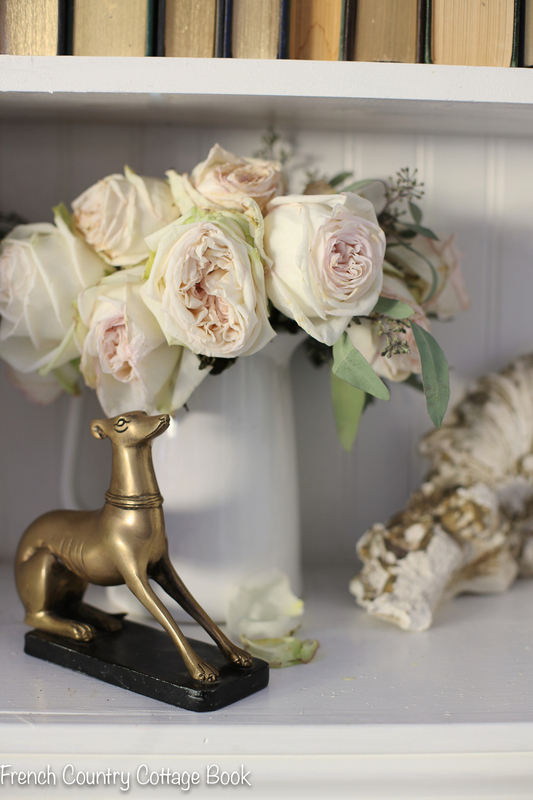 Spring decor is fairly simple around our house... and it usually involves flowers. 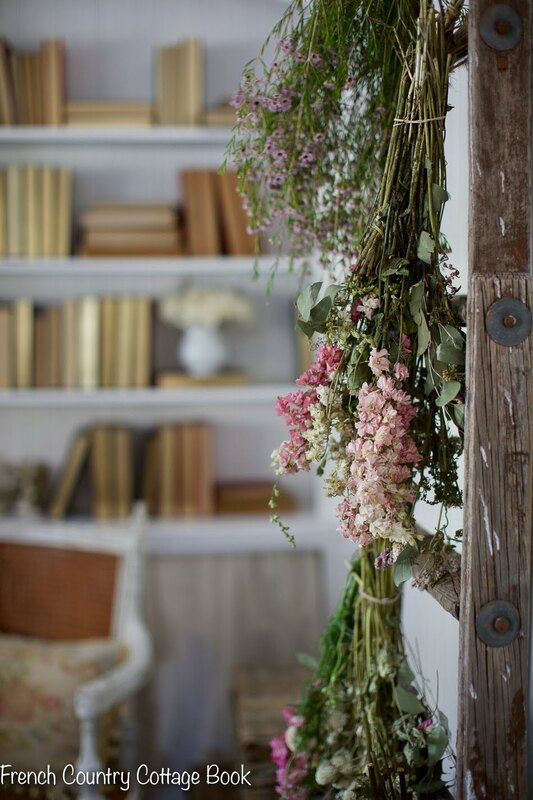 It might be a big bouquet on the table, a tiny vase tucked on a shelf in the kitchen- or it may even be a simple 5 minute idea with dried flowers in the little cottage. A little bit rustic with a sprinkle of feminine charm- the little cottage living room definitely feels like it leans more masculine sometimes. 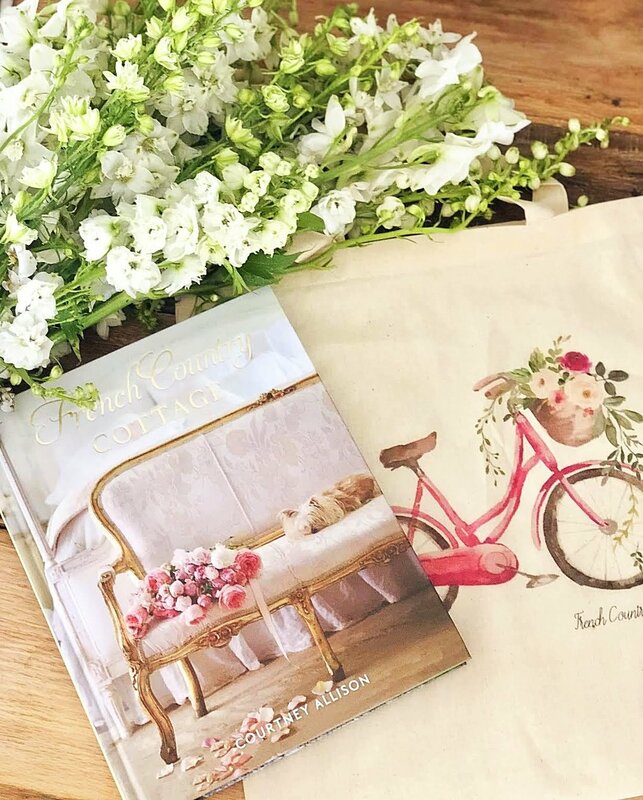 So for spring and summer stylings- I am all about bringing in a bit of softness and warmth to create a cozy soft space to retreat to. So for me that means- flowers. Fresh, dried, faux- you name it. 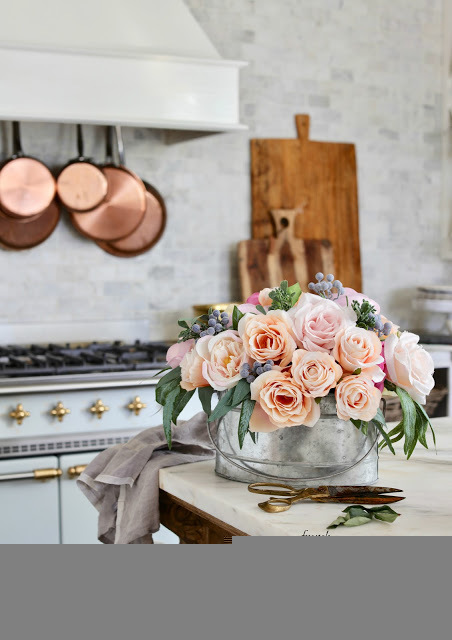 I love to add floral touches and that speaks spring and summer to me all year long. 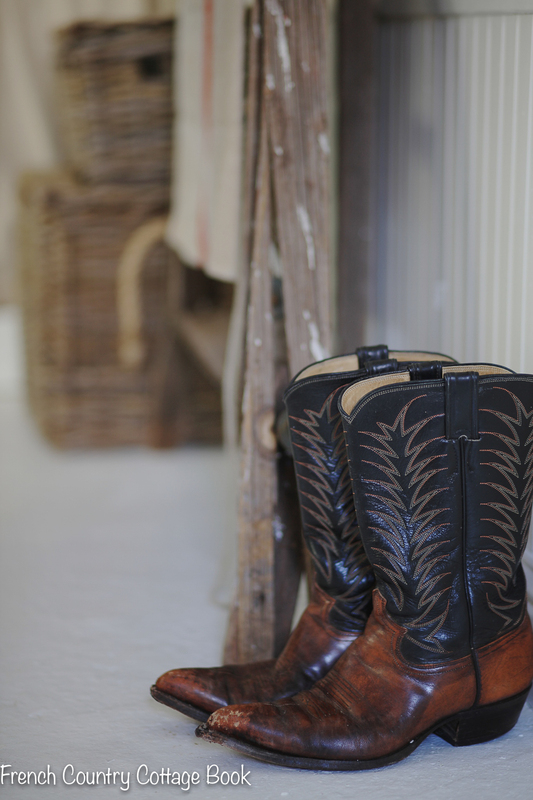 So for a simple touch of spring and a vignette- that is my go to. I also love seasonal decorating that doesn't take hours to put together. But just a few minutes? I am totally in. So for a simple touch of spring in the little cottage- today it is all about flowers and this little corner. 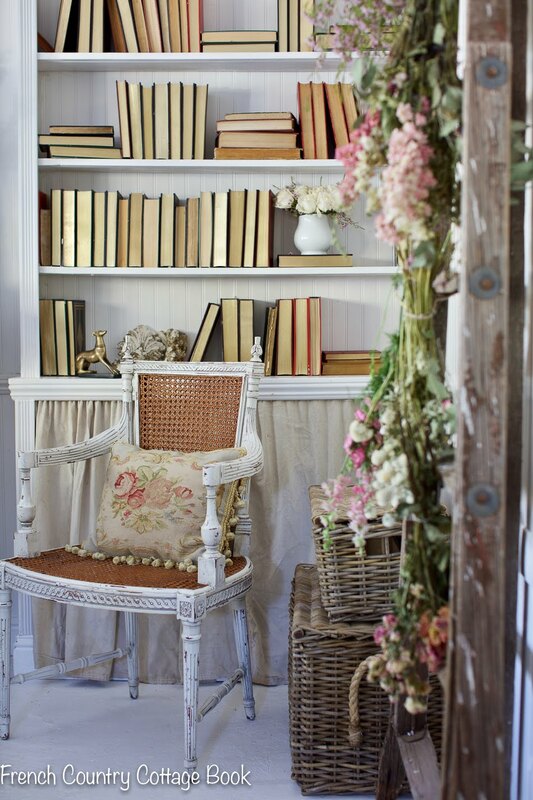 The living room in the little cottage lends itself to a vintage cottage styling- and this little corner is a favorite. With simple painted floors, bead board walls and a pair of built in bookcases that my sons built a few years back- I love the simplicity of styling the shelves and placing a table and chairs or simply a chair in front of them. 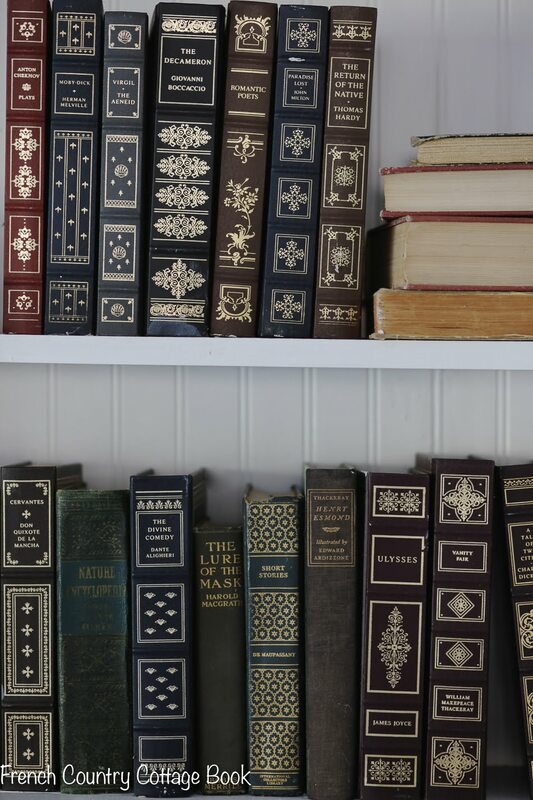 On the shelves- a collection of vintage books, a few old broken architectural bits, an old brass dog bookend and flowers. The plaster ornament is one that broke several years back- but that I couldn't part with. 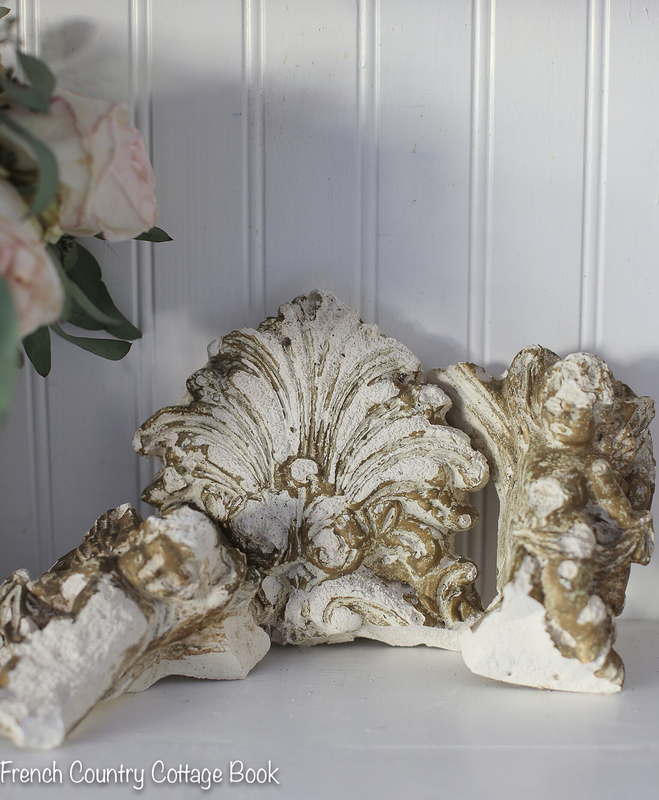 I love the cherubs, gold color and details. I love the soft muted color of the book pages and so oftentimes - you will find them turned to the back to be able to enjoy a more serene view. When they are not turned- they are a bit more masculine but charming as well. I know that the books turned backwards isn't for everyone- but I absolutely love texture and that muted backdrop just speaks my language. Something else that is a favorite in this little corner of the cottage- is the antique orchard ladder. I found this years ago - I saw it leaning against an old barn as I jogged by and always thought it was so charming. The neighbor happened to be out in his yard one day- and so I stopped and asked about it. It turned out he had several of them and this one was older, had a few splits and damage that made it unusable and so he offered it to me if I wanted it. and lovely years lived that are reflected in the dings and dents and age. and hauled it to the cottage. The ceiling is quite tall out in the cottage- and so the nearly 12' of the ladder fit perfectly here. 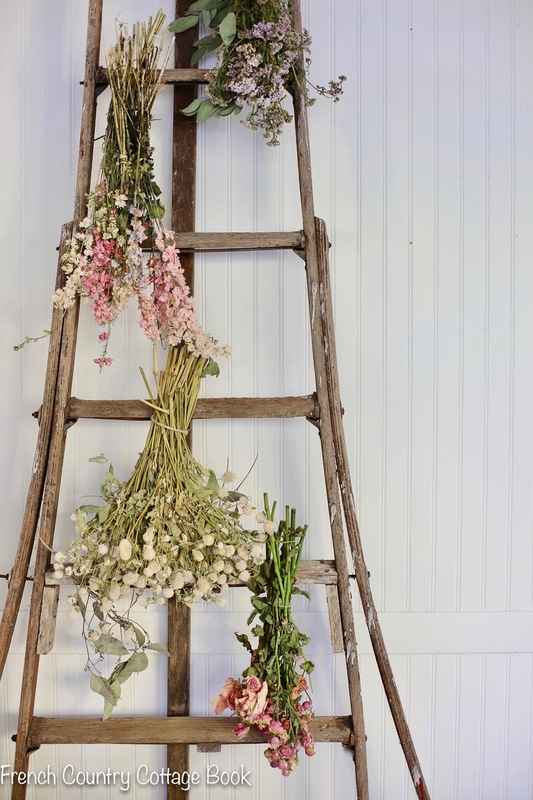 For spring and summer- I love to use it as a flower drying rack- and tie bunches of blooms to the rungs to dry. The flowers also create a beautiful display for enjoying. A simple little sprinkling of spring in the little cottage- but one that works for several seasons with just a few changes. And I love seasonal touches that don't take a ton of time to add. 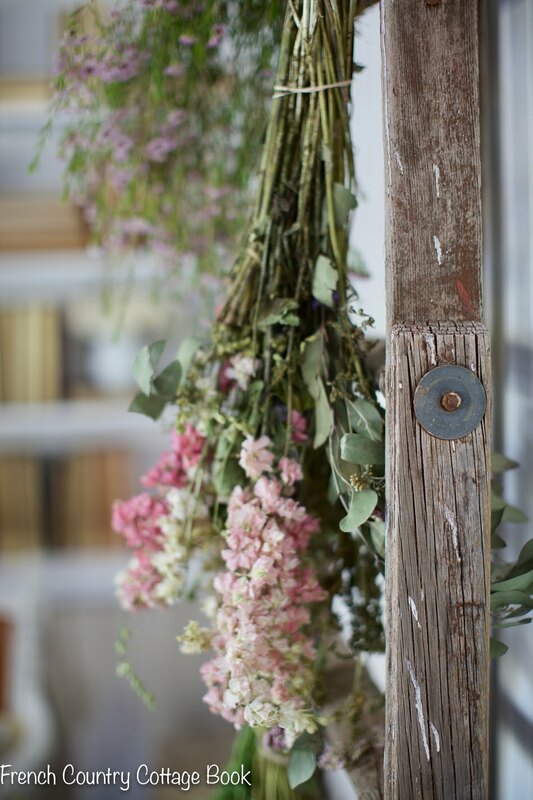 So fresh and dried flowers are a 5 minute decorating tip that works perfectly for me. 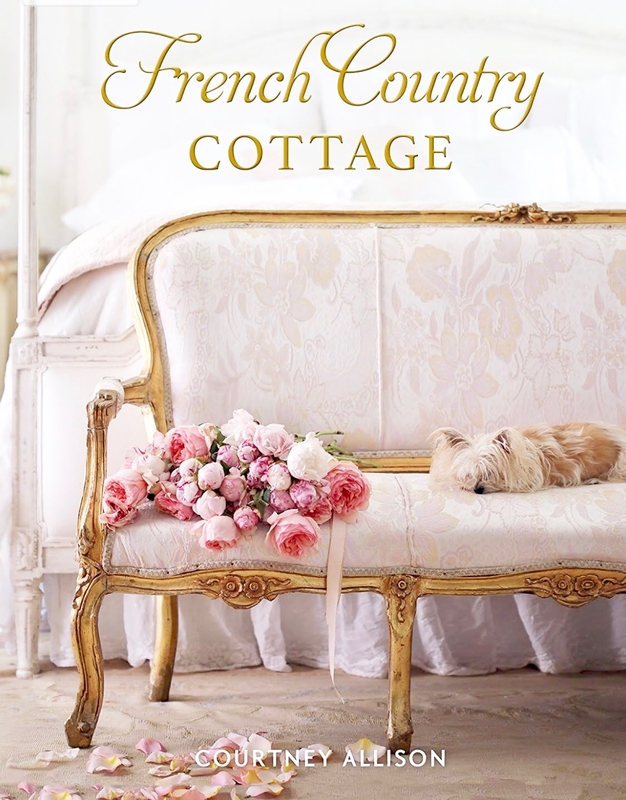 You can see more of the little cottage in my book HERE and stay tuned for a refresh we are doing out here. A few changes that are long overdue and that we are excited to be working on in the next few months. This is such a special pretty spot! Love the bunches of roses on the ladder and that your son made the bookcases too. I remember you posting this ladder over the years. Having this filled with bouquets of dried flowers is soft, romantic and whimsical to me. Courtney, it lovely! Your style never fails to inspire me. I love the use of the ladder. I have an old ladder found many years ago and brought home to use as a quilt rack. I moved it into a closet a few years ago in an effort to declutter the guest room. I may rethink it's use for an upcoming remodel of that room. Yes, you inspire!!! 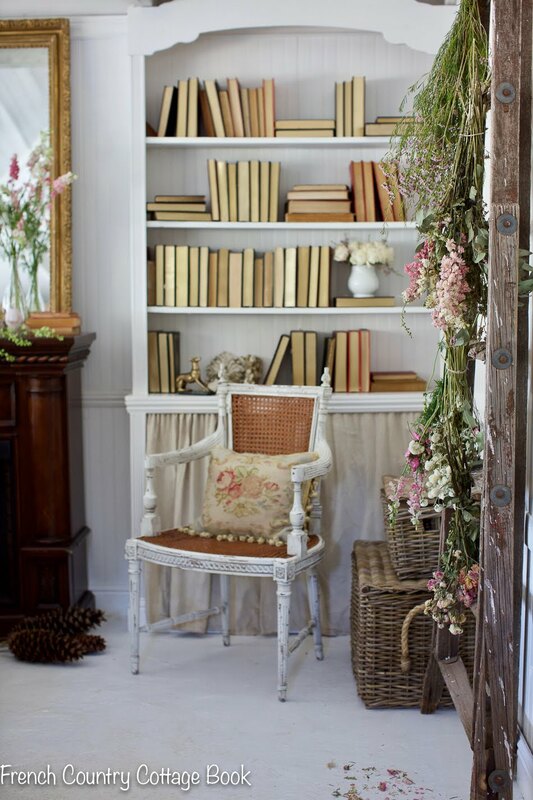 Love the skirting of the bookcase. Really like that idea. Just Beautiful! Love your style! And browse through your book all the time. wonderful post. 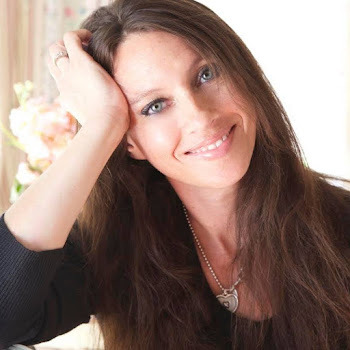 just found your blog, absolutely beautiful! Very pretty...and I do like the look of the books, especially for spring. I think the leather spines look nice for autumn and winter.